Does LSD expand the mind and release artistic creativity? Is it difficult to kick the acid habit? Do LSD users run the ris of brain damage and even death? What progress are scientists making in the treatment of the frightening phenomenon called flashbakcs? These are urgent questions for the 1980s since LSD, after a decade of declining use, is increasing in popularity. In a society turning more and more towards drugs as a way of life, it is crucial that young people be made aware of the effects and dangers of LSD. 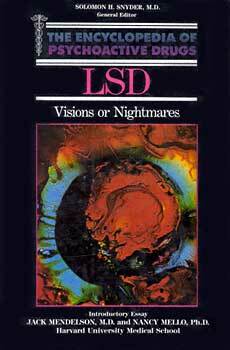 This objective study is a timely presentation of current information on LSD, one of the most potent of all hallucinogens. The Encyclopedia of Psychoactive Drugs answers the questions that young people are likely to ask about drugs, as well as those they might not think to ask, but should. Topics include: what it means to be intoxicated; how drugs affect mood; why people take drugs; who takes them; when they take them; and how much they take. They will learn what happens to a drug when it enters the body. They will learn what it means to get 'hooked' and how it happens. They will learn how drugs affect their driving, their school work and those around them -- their peers, their family, their friends, and their employers. They will learn what the signs are that indicate that a friend or a family member may have a drug problem and to identify four stages leading from drug use to drug abuse.